Level Field: GRASSROOTS TALENT FULLY TAPPED? IS enough being done in schools to promote sports? There are 7,772 primary schools and 2,408 secondary schools for a total of 10,180 in the country. The total enrolment is 5,074,612 or about 16 per cent of the population of 30,751,602. Of the 10,180 schools — 128 are “high performance” and 225 are “cluster”. The Cluster School of Excellence are those that have distinguished themselves by attaining excellence in their cluster — in all aspects of the school management and student achievement. High performance schools are defined as schools that have ethos, character and a unique identity in all aspects of education. They have a tradition of high performance work culture that develops national human capital in a holistic and sustainable manner and are competitive in the international arena. Then there are Sports Schools — Bukit Jalil and Bandar Penawar in Kota Tinggi, Johor — which have an intake about 550 each. From the aspects of management and administration, the schools follow the concept of fully residential school which is equipped with sports and academic facilities. Bukit Jalil Sports School was opened in 1996. Its success in producing athletes for the 1998 Commonwealth Games led to Bandar Penawar Sports School that same year. The government will build another three sports schools under the 9th Malaysia Plan in Pahang, Sabah and Perlis. The ratio between schools and students against students who specialise in sports is far from desired. The National Sports Policy in schools is divided to sports for excellence and sports for all. Sports for excellence comprise of national schools sports competition, sports schools and high performance sports, whereas sports for all under physical education and health, co-curricular and schools sports activities. The problem is a majority of schools have fields either in deplorable conditions, reduced to minimum sizes or too small. Some do not even have fields! In 2011, Education Ministry (MOE) began the “1 student 1 sport” policy. All students were to be involved in at least one sport. The problem is students don’t get to pick the sports but are channelled to the various sports by teachers. But there are not enough qualified teachers to coach? Among the development programme are cross-country, standard test and sports day. Who monitors them? There are tournaments like the Minister of Education League — a national level football competition, but it is only for a select few. What we need is mass participation over a period of time — not carnival tournaments — to spot talent. Under the high performance schools, 2,061 coaches and 37,339 athletes are involved in 860 district training centres which involves eight core sports — football, hockey, gymnastics (artistic and rhythmic), sepak takraw, athletics, archery, bowling and badminton. Then, there are development programmes in the form of league and circuit for football, athletics, hockey and netball. These involve only 1,425 students. The cream of potential athletes for the future surface from the Malaysian School Sports Council (MMSM) sports calendar which involves 24 sports. It involves Under-12, Under-15 and Under-18 boys and girls where 805,088 compete at district level, 100,636 at State level and 12,154 at national level. Top athletes from MSSM competition are then selected to represent the nation at Asean, Southeast Asian, Asian and world age group tournaments. But for these competitions the bulk of athletes come from the two sports schools. Talent identification and development (TID) programme is another source of fresh athletes surfacing. TID programmes are conducted at district, state and national level which involves 12 sports where national sports associations (NSA) are involved in the selection of students to be placed in state and national sports schools. However, the effectiveness depends of the strength of the NSAs and their involvement at grassroots level. Only 2,000 students are involved at national level. MOE and MSSM are trying their best have an effective development programme to provide opportunities for all students to participate in sports and training modules for teachers. MOE need the cooperation of the state and national associations. There are some associations who work closely with them but it has to be more than that. These associations have to work hand in hand with schools. Malaysian Golf Association, FA of Malaysia, Malaysian Rugby Union, BA of Malaysia, Malaysian Tenpin Bowling Congress, Malaysian Athletics Federation, Squash Racquets Association of Malaysia, Malaysian Gymnastics Federation, Malaysian Hockey Confederation and Malaysian Basketball Association have good working relationships with MOE. However, more can be done for programmes to be more effective. 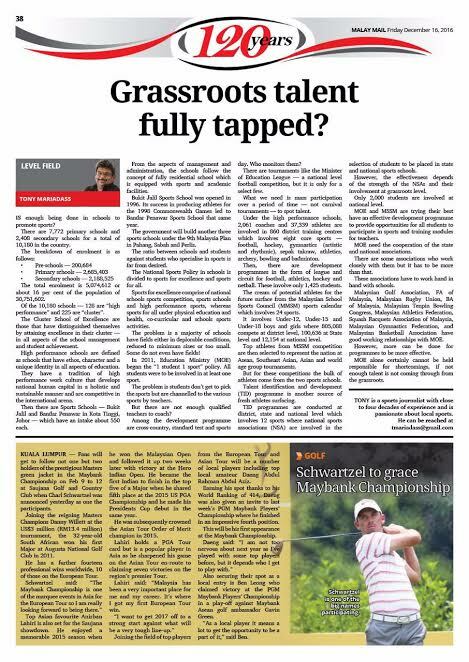 MOE alone certainly cannot be held responsible for shortcomings, if not enough talent is not coming through from the grassroots. TONY is a sports journalist with close to four decades of experience and is passionate about local sports. ORPHANAGES — UNCHARTED SPORTING TURF? IS FOOTBALL A LOST CAUSE?